Yasser Al Mulla’s colourless, intricately lined drawings chromatically compliment his crisp white ankle-length thobe and ringed black eagle. As a Qatari agricultural engineer, Al Mulla spends his days developing the greenery around Doha and perfecting grass pitches in preparation for the 2022 World Cup. But in his evenings, he delineates themes of Sufism and various cultures with discursive black lines on a vast white canvas. Though his artwork has been praised for its mystifying attention to detail, some have questioned why Al Mulla, a 38-year-old Sunni Muslim, depicts the philosophies of the Sufi tradition for leisure. Since high school, Al Mulla has been fascinated by the poems and teachings Mansur Al Hallaj, a Sufi preacher who is best known for his saying: “I am the truth.” Many have interpreted it as a claim to divinity, while others believe it to be a mystical defeat of the ego that allows God to speak through an individual. From a distance, Al Mulla’s drawings resemble inky scribbles. A few steps closer reveal a religious or cultural motif, such as Whirling Dervishes or The Khalifat Visitors of the Abbasid Caliphate, with meandering lines and geometric shapes rippling around them. The figures are doodle-like illustrations, while the lines are contrastingly opaque, undulating and parallel, similar to a moire pattern. 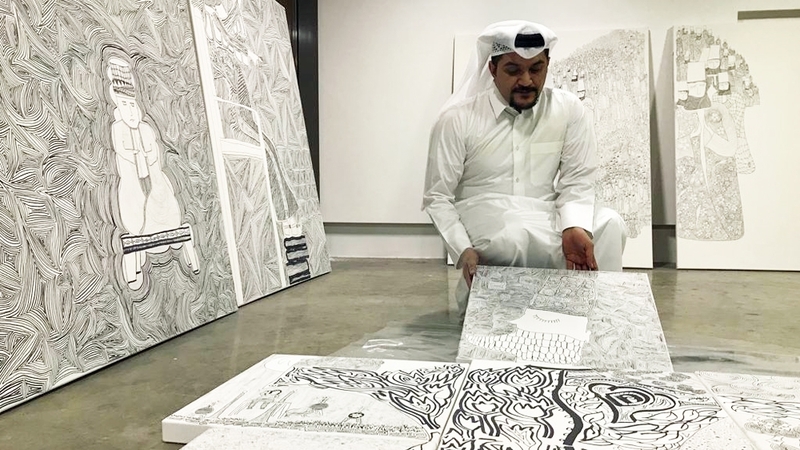 Al Mulla began creating Sufism-inspired line drawings as a 2017-18 resident of the Doha Fire Station, a former emergency services headquarters-turned art hub in the Qatar capital. His studio furnishings do not deviate from his monochrome theme – the couch is black, the white walls are used as canvases and the floor is sprinkled with ebony black pens that Al Mulla decides not to be used twice. As he commits hours to a drawing after compelling inspiration presses his mind, Beethoven’s piano compositions gently play in the background. “This is not work for me; it relieves me from the stresses of work,” said Al Mulla. He finds his reputation shift to an artist difficult to reconcile with since he was previously known as “the engineer guy”, working on landscape projects from Doha’s Aspire Park to those commissioned by Qatar’s emir himself. Al Mulla has gained significant popularity for his landscape art, which is an external representation of his artistic ability. His agricultural work for the World Cup beautifies otherwise barren areas of Qatar and was recently profiled by The New York Times. Regardless of his success, Al Mulla does not want his career to be his “only thing”. He dedicates certain days of the week entirely to his wife and three children, a certain day to his parents as the eldest son and certain nights to his drawings. According to Al Mulla, he paints “under the influence of [his] whole life”. He said that all people are “accumulation of knowledge, experiences and culture” and he attempts to present his own through ambiguous thin and thick black lines against a once-vacant white space. 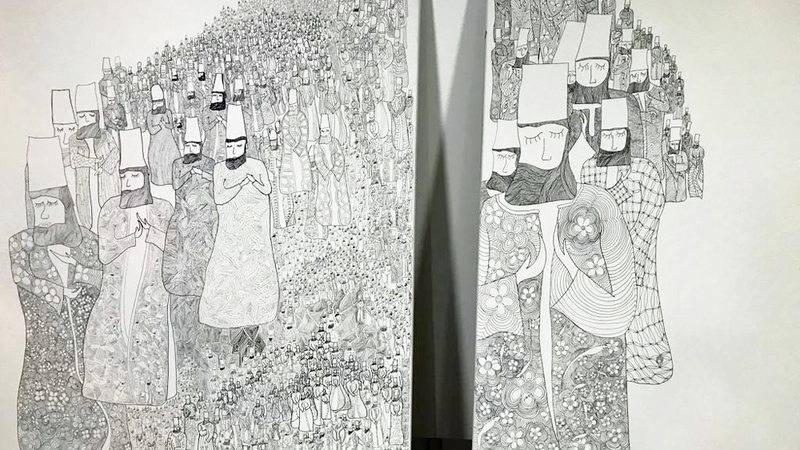 In addition to the personal motivations behind his art, Al Mulla said the controversy of the Sufi influence in his drawings helps with creating open-mindedness in Qatar. The colourless nature of Al Mulla’s drawings makes them appear two-dimensional at a first glance. However, Al Mulla claims to hide philosophical messages in his long, contoured lines to prompt viewers to learn.